Home » Blog » Easy Taco Pie! We are big lovers of Mexican food at my house, and this Taco Pie is no exception! So here’s what happened. I made the English version of Shepherd’s Pie. My whole family freaked out with joy and practically licked their plates. 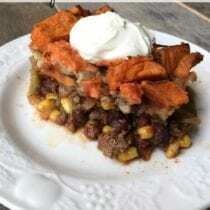 So I thought, “Why not take that recipe, give the meat and veggies a taco flair, and top it with sweet potatoes?” And we now have a new beloved Taco Pie creation! Truth be told, I did start testing this dish with sweet potatoes that I peeled, boiled, and mashed for the top of the casserole (similar to the Shepherd’s Pie recipe). But it felt like a lot of extra work (and dishes to clean) for something that I wanted to be a quick weeknight meal. Heat the olive oil in a large skillet over medium heat. Cook the onion, bell pepper, and jalapeno until they begin to soften, about 4 to 5 minutes. Turn up the heat to medium-high and add the ground beef to the pan. Cook the meat while breaking it up with a spatula until brown all the way through. Add the tomatoes, black beans, frozen corn kernels, and spices. Cook for another 2 to 3 minutes while stirring occasionally to thoroughly combine the mixture. Pour the beef mixture into a rectangular baking dish, top with cheese and then frozen sweet potatoes. Bake for 30 to 35 minutes or until the sweet potatoes are heated all the way through. Serve topped with sour cream if desired. If you don’t use the frozen sweet potatoes, and use freshly cooked/mashed sweet potatoes instead, how does the affect cooking times? It should be done in the same amount of time or maybe even sooner if you are starting with warm potatoes. Good luck! Wow my mouth is watering somewhat lol! you mind if I share this with a friend? I’m totally new to cooking from scratch and he’s helping me…can’t wait to try the easy taco pie. 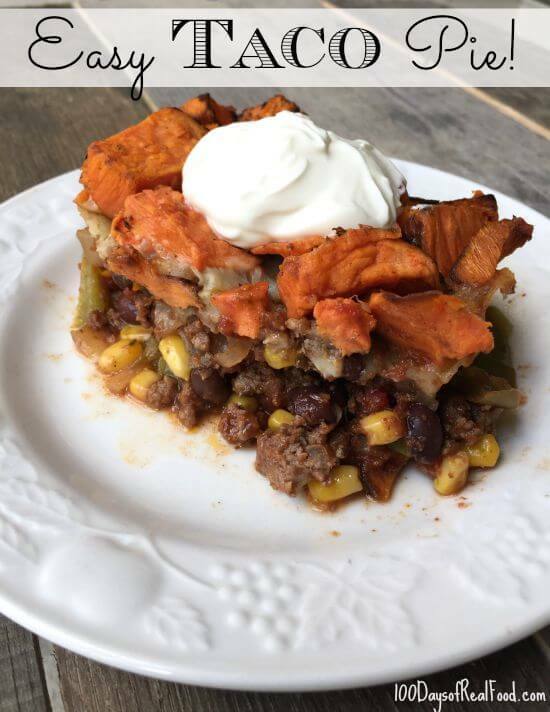 If you need to cook this dish dairy-free to accommodate dairy allergies, do you think it would work to top with sweet potatoes, bake as instructed, and melt cheese on individual portions at the time of serving for those who can enjoy dairy? Yes, that would definitely work! Enjoy. I will report the end result. My kids loved this and that’s saying something because they are picky!! I changed 3 minor things: I left out the bell pepper and oregano and baked it in the same cast iron skillet I cooked everything it. It turned out great. This sounds like a great, quick weeknight meal. 1 question: what brand of canned beans & tomatoes do you use? The only canned beans/tomatoes that I have found have been processed. I typically use dried beans when I cook “Mexican” food, but I was hoping that you found a great shortcut. Also, I just grated my own cheese. That way I can pay myself to grate it instead of others & the additives in grated cheeses are not in block cheese. Thanks for your feedback! Hi there. Eden brand is a good one for both. I’m excited to try this (esp with the time-saving sweet potatoes). What size baking dish do you think works best? Thanks! Tried this tonight and it was so so so good. I’m not a fan of sweet potatoes but trying to eat them more and this was the perfect recipe to make me a fan. We can’t do dairy anymore so I sadly had to skip the sour cream & cheese but I bet it would just bring it to a whole new delicious level. Thanks…I will try this one on my grandchildren next week. Sounds yummy. Can I substitute organic canned corn for the frozen corn? Hi. Sure, that will work, too. Also, do you think this dish would still taste great using ground chicken or ground turkey instead of beef? Yes, you could use ground turkey or chicken. I tried this tonight and it was so good! Love this easy, weeknight meal! Wow, This was a hit at our house! I was not able to get the sweet potatoes and I made a double batch of brown rice (serving size for 4) put that as the bottom layer then the taco layer, cheese. Very Good! How could you work this into a crockpot recipe? I used lentils instead of the meat to make this vegetarian. It was a huge hit! 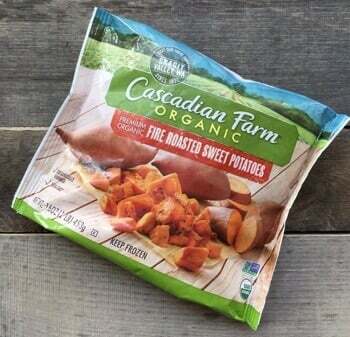 I wonder if raw chopped sweet potatoes would soften in that bake time….my natural food store sells ten oz bags of frozen for a high price point. I used fresh sweet potatoes and just cooked them first, if that helps. How did you cook them? Taco seasoning will work, too. My grocery store didn’t have the frozen sweet potatoes, so I am using butternut squash instead. Keep your fingers crossed. Could this be made a day in advance and then stored in the fridge until ready to bake? (Adding the frozen sweet potato right before baking)? Hi. Just wondering at what store Lisa found the frozen potatoes? I checked my local Earth Fare and Publix and did not see any. Lisa bought hers at Earth Fare. Would this be a good meal to make as a freezer meal? Hi there. Yes, I think it would. Yum! This turned out great. Whole Foods only had Earthbound Farm roasted organic sweet potato slices which worked out great…just followed timing directions on package. This week be a repeat meal. Would the recipe be different if I roasted my own sweet potatoes and they would not be frozen when cooked? Just keep an eye out that you aren’t overcooking the potatoes but I think you will be fine. Hey can this use ground turkey meat? I tried this meal as part of my week 1 of the 6 week challenge. It was amazing! I can’t tell you the last time I was excited to eat lunch! I’m trying it again this week because it’s so cold where I am and it’s warm and hearty, but I’m doing it in the slow cooker. Instead of the oven I am cooking everything on low for 7 hours. Fingers crossed it’s as good as before!